Seeing as you can only have so many fabulous coats to show off in the fall/winter months, I am all for creative layering. When I received this gorgeous fringed knit, I knew I could not allow it to go into hiding under a coat. I couldn't believe my eyes when I saw this street-style pic on Pinterest. I mean talk about layering inspiration. I wore this running Christmas errands and I got numerous compliments on this fringed beauty. When a piece is too good to go hiding under a coat, wear it over one. This entry was posted on Monday, December 16, 2013 and is filed under black,brown,district collection,fringe. You can follow any responses to this entry through the RSS 2.0. You can leave a response. From now on I will always leave the fringe out! Thanks for sharing with Visible Monday, you look fab. I love the way you layer, it's so creative and chic. The fringe is fab! This is such a great idea, Sheree!! I have a fringy wool sweater that's a real stand-out piece, too...it's warm, but perhaps not quite warm enough to wear on its own at this time of year; I think I'm going to try layering it over my leather jacket as well!! Thank YOU for the inspiration!! Head to toe fantastic. Love the layers of leather and fringed sweater and crazy for the boots. I just discovered your blog ( I think you were the co-host on Style Elixir) I am a huge fan! Love this look....actually I love all your looks. And you're a mom which is a HUGE plus. Really looking forward to following you. i loved how you layered your sweater over the leather jacket. 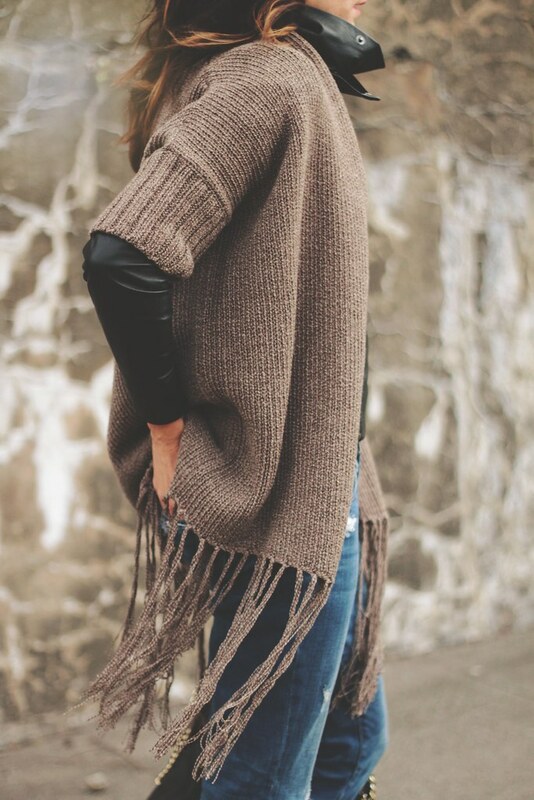 the fringe on your sweater is tres chic!